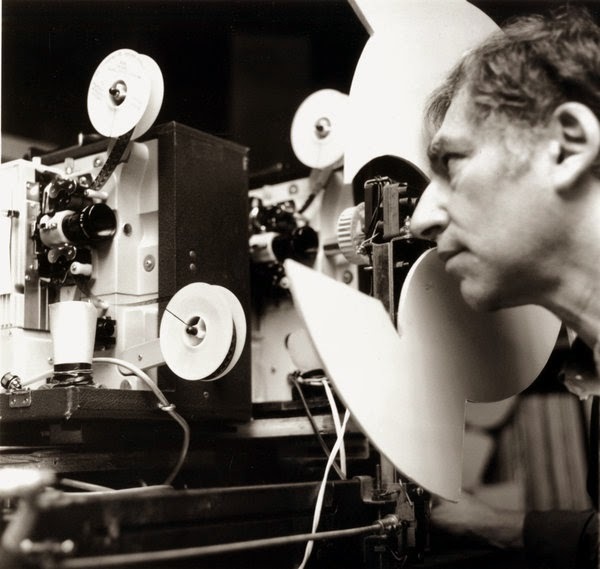 A pioneer of the American film avant-garde of the 1960s and '70s, Ken Jacobs is a central figure in post-war experimental cinema. 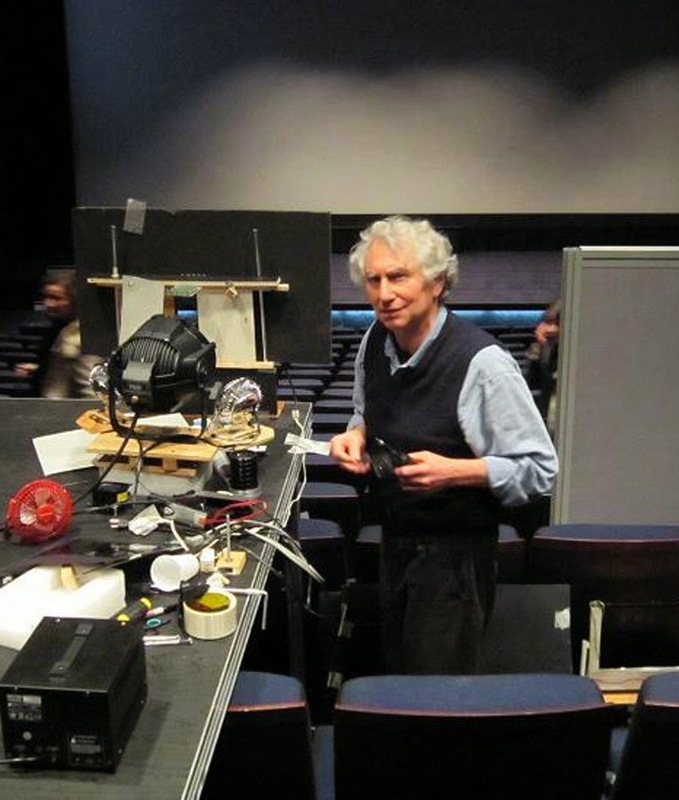 From his first films of the late 1950s to his recent experiments with digital video, his investigations and innovations have influenced countless artists. A New Yorker by birth, Jacobs graduated from City University to find himself in the midst of the downtown art scene of the 1960s, which included artists Robert Rauschenberg and Andy Warhol, beat writers Allen Ginsberg and Jack Kerouac; and the experimental theater troupes of Trisha Brown and Yvonne Rainer. Although Jacobs had studied painting with Hans Hoffman, he quickly gravitated to film, finding kindred spirits in radical filmmakers such as Jonas Mekas and Hollis Frampton. An early friendship with Jack Smith yielded several collaborations, including the seminal underground films Blonde Cobra (which Jonas Mekas dubbed "the masterpiece of Baudelairean cinema") and Little Stabs at Happiness, as well as a Provincetown beach-based live show, The Human Wreckage Review. Jacobs has long been a cinema activist. 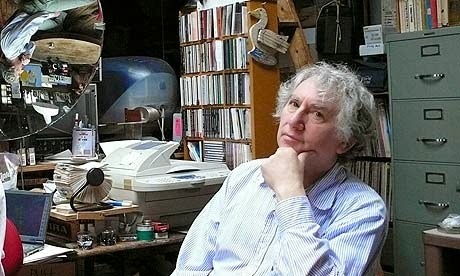 He was an integral part of Manhattan's burgeoning alternative film scene, which included venues such as the Film-Makers' Cooperative and The Bleecker Street Cinema (which notoriously premiered Blonde Cobra with Smith's Flaming Creatures) as well as his own loft, where the Kuchar brothers first screened their 8mm work. In 1966, he and his wife Flo founded Millennium Film Workshop, and he was a cofounder of one of the country's earliest departments of cinema, at Binghamton University. 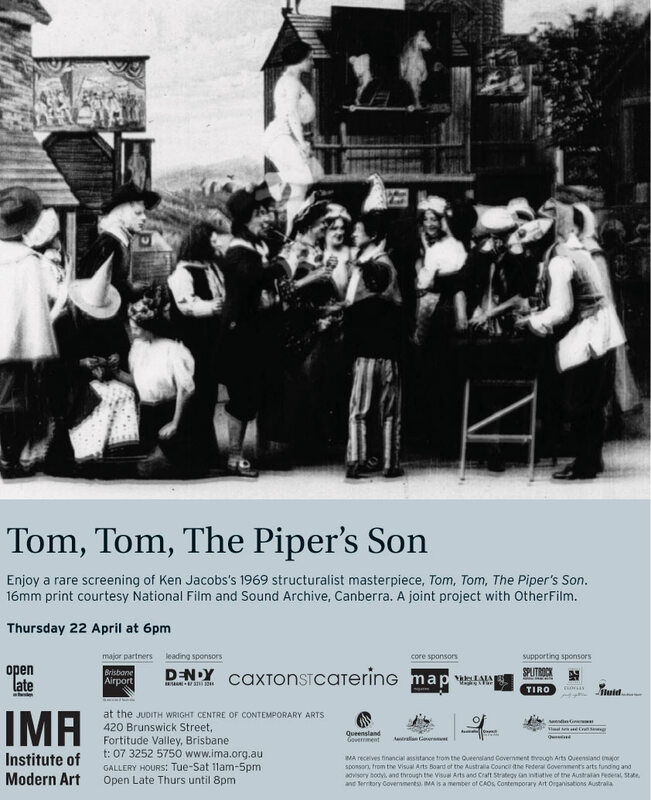 Tom, Tom the Piper's Son is, in its total concentration on the formal and material properties of the medium, perhaps the quintessential work of 1970s structuralist filmmaking. It was also an indication of the direction in which Jacobs would proceed, wherein actors and narrative would fall away, replaced by a concentration on the rigorous pleasures of the cinematic unconscious. As he has suggested, "there's already so much film. Let's draw some of it out for a deeper look, toy with it, take it into a new light with inventive and expressive projection. Freud would suggest doing so as a way to look into our minds." In later films such as Perfect Film (1986) and Opening the Nineteenth Century: 1896 (1990), Jacobs continued to explore his pioneering appropriation strategies. 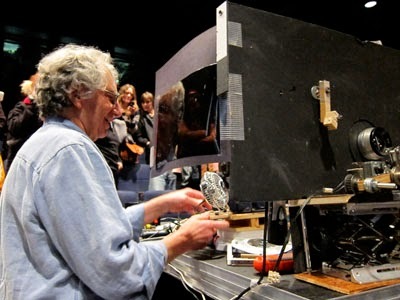 His interest in performance has never waned, however, as evidenced by Nervous System, a live show incorporating two film projectors, a propeller, and individual filters through which audience members view the double image. Writes Jacobs: "The throbbing flickering is necessary to create 'eternalisms': unfrozen slices of time, sustained movements going nowhere and unlike anything in life." Jacobs' recent video work, such as Flo Rounds A Corner (1999), have successfully transferred the "eternalisms" effect to the digital realm. Jacobs' insistence on cinema as a "development of mind" can be seen, despite his protestations to the contrary, as a conceptual approach to art-making practice, one that has yielded groundbreaking work across media. 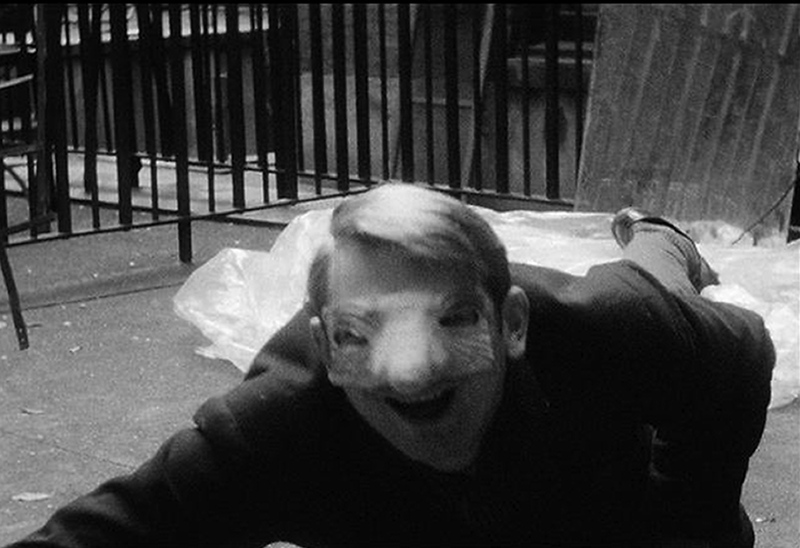 In his activism, film, performance, and video, he has consistently expanded the practice of the avant-garde moving image. Whether undertaking archaeological journeys to the birth of cinema, or scrutinizing the interstices of new digital technologies, Jacobs' work investigates, provokes, and draws power from the mysteries of the nature of human vision. Ken Jacobs, “Slow is Beauty”—Rodin, Idea Warehouse, November 1974. Ken Jacobs was born in 1933 in Brooklyn, New York. He has received numerous awards, including the Maya Deren Award, a John Simon Guggenheim Fellowship, as well as grants from the National Endowment for the Arts, the Rockefeller Foundation, and the New York State Council on the Arts. In 1969, with the help of Larry Gottheim and Gottheim's students (one of whom was J. Hoberman, current senior film critic for the Village Voice), Jacobs began the Cinema Department at SUNY Binghamton and taught there until 2002. His films, videos and performances have received international venues such as the Berlin Film Festival, the London Film Festival, the Hong Kong Film Festival, the New York Film Festival, the American Museum of the Moving Image, Astoria, New York; the Whitney Museum of American Art, New York; and The Museum of Modern Art, New York. He was a featured filmmaker at the International Film Festival Rotterdam in 2004. Jacobs lives in New York City. The moving camera shapes the screen image with great purposefulness, using the frame of a window as fulcrum upon which to wheel about the exterior scene. The zoom lens rips, pulling depth planes apart and slapping them together, contracting and expanding in concurrence with camera movements to impart a terrific apparent-motion to the complex of the object-forms pictured on the horizontal-vertical screen, its axis steadied by the audience's sense of gravity. The camera's movements in being transferred to objects tend also to be greatly magnified (instead of the camera the adjacent building turns). About four years of studying the window-complex preceded the afternoon of actual shooting (a true instance of cinematic action-painting). The film exists as it came out of the camera barring one mechanically necessary mid-reel splice. I've been raiding the Paper Print Collection of the Library Of Congress in Washington, DC, since the late 1960s with TOM, TOM, THE PIPER'S SON. It's a preserve of early cinema. Until 1912, in order to copyright film, one deposited with the library a positive from the negative printed on paper, unprojectable, but - unlike nitrate prints - capable of weathering the years without Crumbling into chemical volatility. And there the stacks rested, safely out of mind, hundreds and hundreds of silent rolls most less than 30 meters, many Edisons, American Mutoscope And Biograph, Gaumont, Lubin, Vitagraph ; cine-snatches of life as it was lived, vaudevillians, proto-dramas, and too many state parades. Until they were ripe for rediscovery and reevaluation, and rephotography back onto film. THE GEORGETOWN LOOP is my 11-minute riff on "The Scenic Wonder Of Colorado", a rail-line built in the 1870s through daunting mountain terrain to serve the silver mining industry. I've called it the first landscape film deserving of an X-rating, and that it is, yet its secret subtitle is - I must whisper. This work contains throbbing light. Should not be viewed by individuals with epilepsy or seizure disorders. Ken Jacobs writes: "Stereograph of the crowd at the opening of the US Centennial Exposition of 1893. It turns into a movie. Into an enormous rugged and craggy 3-D landscape.... before the people return and the scene is righted again. Many laws were broken in the making of this movie, beginning with laws of gravity." "I wish more stuff was available in its raw state, as primary source material for anyone to consider, and to leave for others in just that way, the evidence uncontaminated by compulsive proprietary misapplied artistry, ‘editing’, the purposeful ‘pointing things out’ that cuts a road straight and narrow through the cine-jungle; we barrel through thinking we’re going somewhere and miss it all. Better to just be pointed to the territory, to put in time exploring, roughing it, on our own." The story goes that Ken Jacobs‘ 1986 work Perfect Film is literally a found film: the experimental filmmaker came upon the reels at a shop, bought them, made a print, tweaked the volume, and released the piece as a raw untouched document (consisting of—in this case—footage of news interviews following the death of Malcolm X). A possibly satisfactory example of that always suspicious term “pure cinema”, Perfect Film is Jacobs’ humbled gesture towards the integrity of the cinematographic image, resurrecting a discarded arbitrary artifact to not simply present what it was…but to establish what it is and what it can be. In Celestial Subway Lines/Salvaging Noise its story is told by director Ken Jacobs but without the conventional storyline. Using a modified magic lantern, an early type of image projector developed in the 17th century, he morphs, flickering images that look like photo-negatives. This is accompanied by industrial sound and music provided by John Zorn and Ikue Mori. The Nervous Magic Lantern, a manifestation of Jacobs’ ‘paracinema’, is an ecstatic, ephemeral, hallucinatory, three-dimensional viewing experience, which he evocatively describes as ‘cinema without film or electronics’. Combining aspects of his earlier Nervous System apparatus with a traditional magic lantern projector, Jacobs creates an illusory dreamworld, where the spectator is immersed in abstract, rotating visions. With this performance, Jacobs returns to cinema’s roots, underlining the importance of precinema in his work. Before the invention of celluloid, audiences were mesmerised by the Phantasmagoria – a lamp, lens and painted slides; today, Jacobs transforms hand-crafted collages into impossible and unforgettable visual phenomena. Ken Jacobs and Aki Onda first collaborated for a live projection event at BOZAR, Brussels, in 2007, and have since performed together on a number of occasions. Onda (JP, 1967) is an electronic musician, composer, and visual artist who currently resides in new York. He is particularly known for his Cassette Memories project – works compiled from a ‘sound diary’ of field-recordings collected by the artist over a span of two decades.